Combine all the ingredients in a food processor or blender fitted with a steel blade. Pour into tall glasses with ice cubes; garnish with mint leaves and serve. 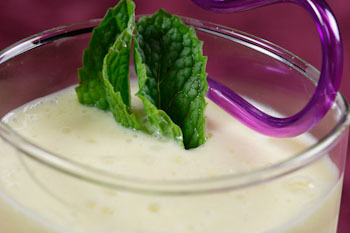 The tangy-sweet taste of mangoes makes this light, healthy, and easy-to-make smoothie a great ending to a spicy dinner.